Custom pendant lamps built for the historic Masonic Lodge in Sag Harbor, NY . This building located at 200 Main St. was commissioned by the whaling captain Benjamin Huntting, in 1845. The middle of the lamp features a globe bulb with (2) round, decorative diffusers and gives the lamp a balanced visual "center". Colors and finishes were kept neutral as not to compete with the colorful mural artwork. 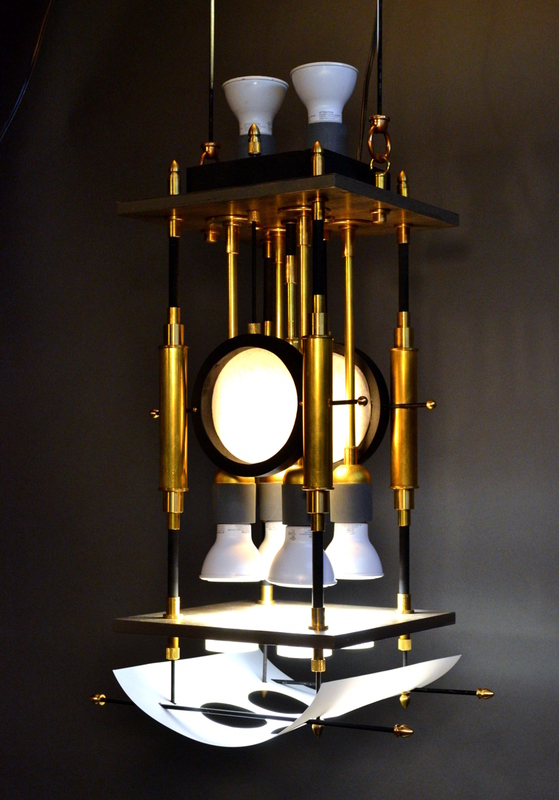 Matte Gray maple hardwood, 24K gold-finished brass, matte black steel and white details. The "sail" at the bottom(white polycarbonate) hides bulb glare. 24" tall x 9" sq. May be specified to any height and dimensions.